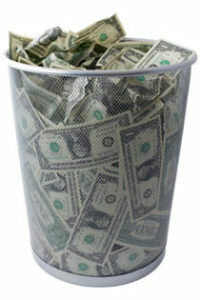 NIR Roof Care, Inc.® > NIR Blog > Stop Throwing Your Money Away on Commercial Roof Replacement! Don’t throw your money away on a Re-Roof! You could save $70,000 to $2,225,000 in 5 years . . .
You will spend anywhere from $70,000 to $2,225,000 in the next 5 – 15 years on a new commercial roof that you don’t need. This expense is completely avoidable. From working with 1000’s of companies with commercial roofs ranging in size from 10,000 sq. ft. to over 1 million sq. ft., every single business we’ve ever looked at has unnecessarily wasted money on a roof replacement. This money is almost never budgeted for and is always avoidable. Our BEST customers are those who can’t afford or don’t want to take on new debt to replace their roof and are open to alternatives that can save them thousands. At NIR, “Your Roof’s Care Is Our Concern®” is more than our motto. We are Focused on extending the life of your commercial roof as long as possible, all while providing outstanding customer service. 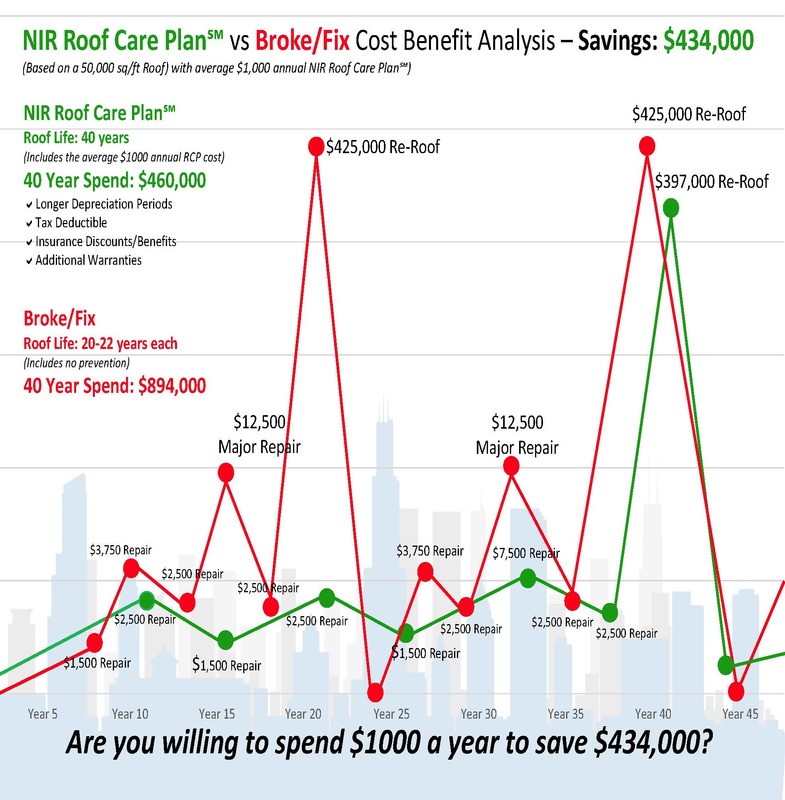 Through the creation of the NIR Roof Care Plan℠, NIR will extend the life of your roof by 100%. Take a look at the enclosed cost-benefit analysis. With roofing being replaced with 30% of the usable life left, Companies are losing money they could have reinvested into their business. Case Study – One customer came to us, asking for a bid on a new roof that they had just acquired funding for from their lender. This was an unexpected expense that they were not prepared for. To get the funding, they had to take out a line of credit they didn’t want to take out, but they knew they had to. Our NIR Certified Roof Care Specialist® drove his Company Owned Mobil Service Unit to his property, spoke to him briefly to get a history of their roof, and then prepared a NIR Roof Care Plan℠. Our Roof Care Plan extended the life of their roof until it was replaced… at close to 40 years old! Had he chosen to not maintain, he would have been looking for another lender to pay for another roof already! The end result, the customer did NOT have to spend hundreds of thousands of dollars, they also did not have to take on the debt for the loan to do this. Their roof was “good as new”, their cash flow was freed up and they went back to focusing on their money priorities. Since most businesses don’t know when their roofs need to be replaced, most businesses replace their roofs with 30% of their life still left. Would you like to know the state of your roof? Would you like to know if there are any major problems with your roof and if they can be avoided? Our typical customer saves between $70,000 to $6,000,000 in unnecessary expenses. Would you like to know how much you can save? Are you willing to invest 15 minutes to find out? If you like to take action and are concerned about your roof or just want to add profit to your bottom line (like “found money”), then we have a no-cost, no obligation inspection we can do if you allow us to. Let me send a NIR Certified Roof Care Specialist® to your company and prepare a NIR Roof Care Plan℠ for your building. You will know that the only way we will even speak of replacing your roof is if there are no other options that make financial sense. We never use sub-contractors and employ only quality roofing professionals. With close to 40 years in this industry, we’re not going to leave you high and dry after we’re done either. We’re committed to returning, year after year, making sure you get the best return on your investment. Call us today and Let’s Make it Last®! ← Skylights need extra care!